Discovered during beta-1 testing of oneiric-server-amd64 images. Installation of both authenticated and unauthenticated iscsi clients works just fine; they network boot and appear to be OK until the iscsid starts up - at which point boot is really slow with lots of recoverable errors. I can't logon to the system as it won't complete boot but I have attached two screenshots. I'm using a lucid iscsi target which has been good for testing so-far this release. I can of course mount the target disks on the iscsi target host itself if anything on the target filesystem might be of interest. I wonder if this is another case of networking being ripped out from under the iSCSI stack during boot? That's been a problem in the past. Which describe who to get the client VM installed but I couldn't easily find instructions on setting up the server side with I'm assuming dhcp, tftp and the iscsi target. Do we have documentation for that somewhere? Sadly I'm not done configuring my SAN to act as an iSCSI target yet so I won't be able to use it for that (FC only at the moment) so I'll need to have that running in a VM too. This appears to be reproducible on arm platforms as well, using both AMD64 and armel target hosts and armel initiator. As to documentation, we need better documentation for raw system setup. Not everyone will be running this in a vm (actually, quite few I would imagine). Successfully reproduced here on kvm. Initial testing shows that the open-iscsi init script seems to be the cause of the disconnect and input/output errors. Removing it from the boot sequence lets me boot and get a shell without storage related errors. I'm not too familiar with iscsi so I'll now have to dig a bit into open-iscsi and see exactly what it's trying to do at boot time. As iscsi is already in use for the root device, my hope would be that it would keep it as it's an only initialize any other lun you may need. Would be great if you could confirm that disabled open-iscsi from your target systems doesn't give you any error and that the system behaves as it should (it seems to be taking quite a bit of time to boot here, no idea if that's normal for iscsi boot). Then everything freezes and I get input/output errors. 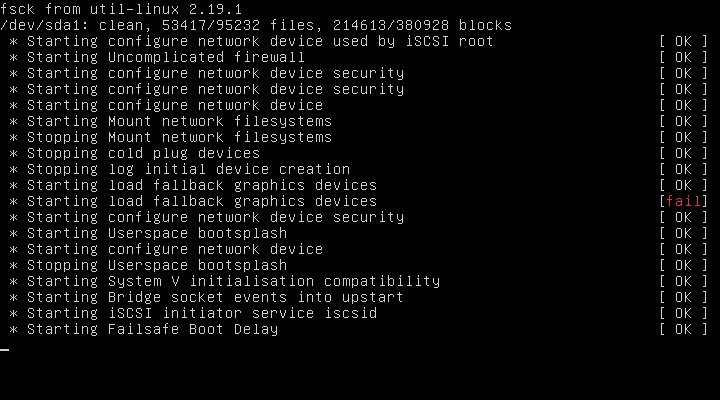 So it seems like even though iscsid ran properly from initramfs, the same done on the booted system fails, thereby breaking the already established connection and crashing the system. I guess I'll need to talk to someone with a bit more iscsi experience though my feeling so far is that iscsistart works properly from the initramfs, mounts the lun and then mounts the root device. 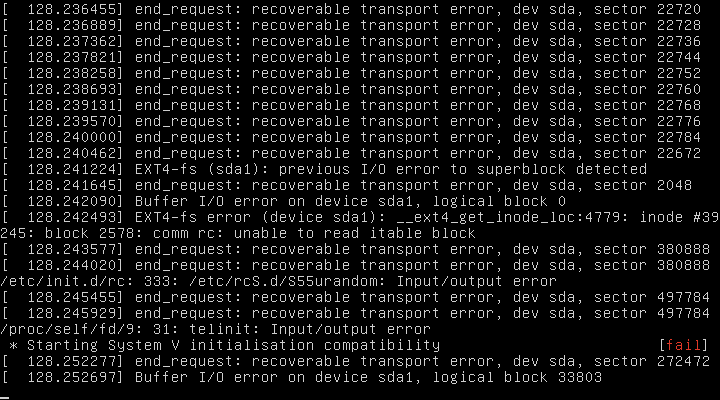 When iscsid then starts, it tries to disconnect the existing device and re-establish the connection and fails to do so for some reason. I reproduced the same behaviour on another oneiric system booting from an harddrive and having an iscsi lun mounted by the initramfs, that way I can debug it without having my root filesystem disconnected. Here is the result of a "grep -i auth" on the level 9 debug output of iscsid on the client. This confirms that the client indeed tries to authenticate using CHAP instead of None and doesn't respect its own configuration. When was the last time that test was successful? I had a quick look through the package history and can't find anything in open-iscsi that'd explain this bug (package almost didn't change since natty) and my VM now runs Natty's kernel and still reproduces the bug. These tests passed during alpha3 testing. If I revert the change to rc-sysinit.conf the system boots fine - open-iscsi is only run on IFACE lo which does an exit 0 so no iscsid is tarted. With this change in place iscsid runs for lo and eth0 which then results in a large number of IO errors and general system mis-behaviour. so the problem is that the init script now does what it's supposed to do. I did a quick test on Natty and can also confirm that back then iscsid was just exitting and never tried to setup iscsi at boot time. - If it does, then "exit 0"
This will restore the old behaviour we had before the upstart fix, this still won't take care of the use case where your root is on an iscsi LUN and you have other LUNs that need to be mounted by open-iscsi, but my understanding is that it never worked.